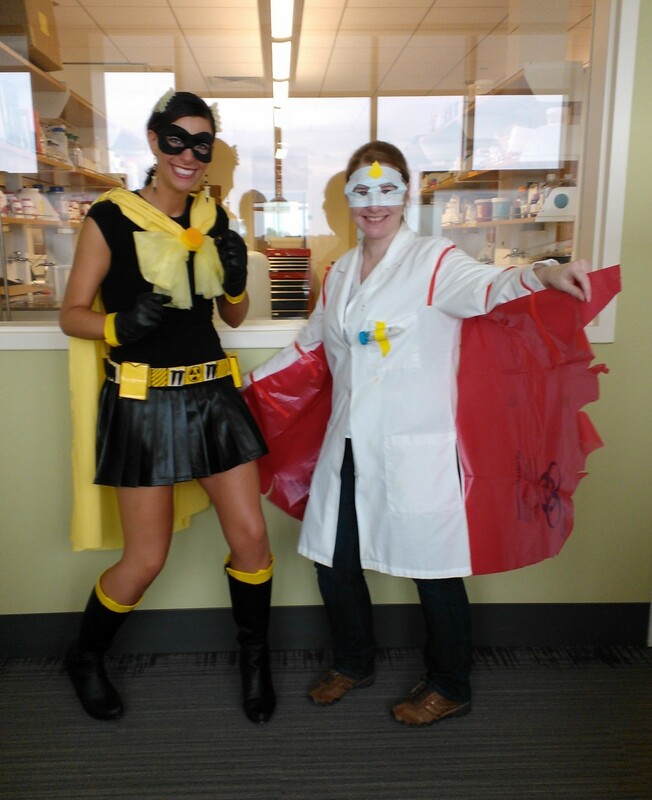 Ok, so there’s no way I could top last year’s lab superheroes costumes I did with my coworker, but there are limited options for Halloween costumes involving lab coats. So today I was Bruce Banner beginning to change into the Hulk (we have green gloves at work). The problem with doing this kind of half-assed costume is that I had to explain it to literally everyone I saw; to be fair, very few of my coworkers are nerds and about half of them are foreign, so Bruce Banner is not a household name. So, what part of the Hulk actually changes first anyway? I tried to watch some clips from the movies but couldn’t tell for sure. I figured hands were a good guess. Our trick-or-treat will be tomorrow night, because our town had a home football game tonight. Welcome to Ohio. My co-worker and I dressed as lab superheroes today. Here we are as Sailor Eppendorf and Falcon Tube. She added Eppendorf tubes to her utility belt and earrings. I made my wings with a biohazard bag (unused!!) and used a surgical mask for my Falcon mask. Now I’m headed back downstairs to eat leftover candy and watch Corpse Bride while I plot my novel for NaNoWriMo. I will probably not be posting as much in November! For some stupid reason, the communities in our area have a set time for Trick-or-Treating, always the weekend before Halloween, usually starting when it is light, around 4 or 5pm. I think this takes all the fun out of it. When I was little, waiting for it to get dark on Halloween night was like trying to sleep on Christmas Eve. So we had our Trick-or-Treat this evening, and of course I bought way more candy than I needed. I love handing out candy and I wanted to make sure we had a good selection! My husband likes to give Snickers, and I love Wonka candy like Nerds and Gobstoppers. I mostly let kids pick what they wanted, and a ton of them picked based on color of the candy. Nerds were surprising popular, especially with little girls due to the pink and purple boxes. One kid yelled “I got yellow!” as he descending our porch steps with a Butterfinger bar. There were plenty of cute costumes, including a penguin, several fairies, clowns, and mobsters, Harry Potter, a Transformer, the Stay Puft Man, Where’s Waldo, a bunch of boys in generic scary masks, and one very darling Supergirl. Trick-or-treating in Ohio sometimes creates complications with costumes–it was in the 40s today, and even princesses need coats. It always reminds me of Molly McIntire, who had to wear a sweater with her hula girl costume (she lives in Illinois). I certainly didn’t need to do that when I was a hula girl…because I lived in Florida.